Let’s face it—we are all imperfect parents in one way or another. Even though we realize that no one gets it right all the time, it’s still easy to judge and label yourself a “good parent” or “bad parent” depending upon how you handle a given situation. But as James Lehman says, “The important thing is to be a ‘good enough’ parent.” A good enough parent takes care of their child, tries their best, and looks for help when they need it.The good news is that by becoming a more effective parent, you can work on things to help improve your child’s behavior. 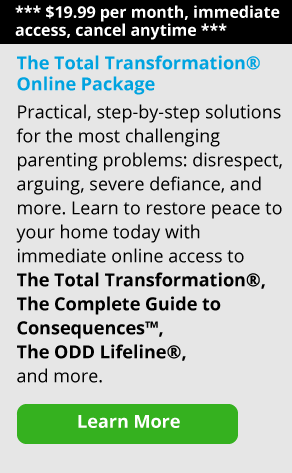 Here are six “Ineffective Parenting Roles” that James Lehman talks about in The Total Transformation Program. One of the core building blocks of his program is identifying your own parenting style to see what’s working and what isn’t. A parenting style, or a “role” as it’s sometimes called, is how you habitually respond to a parenting situation. If you find your child’s behavior isn’t changing (or is even getting worse), stopping and looking at things more closely can be so helpful. As they say, the definition of insanity is “doing something the same way and expecting things to change.” By realizing the role you are playing as a parent, you can learn how to do things differently in order to help change your child’s behavior. Here are six common roles that parents often find themselves in—and how you can get out of them. This is an ineffective parenting style that many of us can identify with. If you allow your child to discuss consequences, boundaries, and rules—often succeeding in getting you to skew the rules in their favor—you might be an over-negotiator. These parents might agree to a lighter consequence after an inappropriate behavior just because the child talks them into it. As James says, ”Your child becomes an expert at pushing boundaries, because he knows they can always be changed.” If you fall into this ineffective parenting style, you’re probably accustomed to arguments and debates over the fairness of the rules, and whether or not your expectations are valid. The solution: The over-negotiating parent needs to be firm about their rules, expectations, and consequences. Don’t allow your child to change the rules, or let them negotiate for a different consequence after the fact. By staying firm and clear, you help your child become accountable for their actions. The parent who ends up screaming and yelling at their child is often acting from deep frustration and exhaustion. While understandable (most parents have been there), the fact is that losing your temper is unlikely to result in positive behavioral changes in your child. If you get drawn into screaming matches, name-calling, or using threats, the message you’re sending to your child is that you are not in control. What this also means is that your authority is jeopardized. It’s as if, for that moment, you’ve come down to your child’s behavioral level. 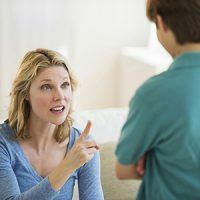 The mom or dad stuck in this ineffective parenting style can even find themselves drawn into defending their own behavior; their child can easily deflect their own behavior issues by pointing out how badly their parent is behaving. The solution: The screamer parent needs to learn more effective ways to handle their own frustration and annoyance. We all get worn down (or worked up) and snap sometimes. It’s part of the territory of parenting. But unless you get a handle on your own temper, your child is unlikely to see you as the calm, clear authority they need in order to get their own behavior in check. Related: Tired of Yelling at Your Child? This parent never wants to see their child fail or feel distress. If you want to protect your child from difficult emotions, you might work tirelessly to be sure he or she doesn’t feel left out or frustrated. You might find yourself working far harder on homework or projects than your child does. You want the road ahead to be as smooth as possible for your child. How can this be bad? The thing is, when you rush in to do things for your child, what you’re actually doing is sending a message that you don’t think they’re capable of handling the situation well on their own. And, that may be true! You might be worried that they can’t do it. But the truth is—and this is important—kids learn problem-solving skills as they fail. They learn to handle feelings of frustration only if they get to experience frustration. If you make the road too easy for your child, protecting them against every feeling of failure or frustration, you are keeping them from learning their own strength. And, you’re exhausting yourself in the process! The perfectionist parent can be seen as the flip side of the martyr: instead of seeing everything your child does as great, this parent sees everything their child does as not good enough. Parents stuck in this ineffective parenting style know their kids have great talents, they just need to work harder at them. So why would that be ineffective? Because the perfectionist parent teaches the child that failure is expected from them. If a child can never measure up to the high standards their parents have for them, why should they even try? And if the child is successful, the perfectionist parent will often raise the bar, insisting that their child can do even better next time. Perfectionist parents often feel they know their child so well, they know what they’re thinking. They often assume the worst, detecting their child’s assumed bad attitude even before the child opens their mouth. Why is this ineffective? Unfortunately, what you’re teaching your child is to never show their emotions, to keep any accomplishments to themselves, and to avoid interacting with you. Why? Because they know they will never be good enough. You’re not teaching your child to reach their potential; you’re teaching them to cringe at every correction. The solution: The perfectionist parent needs to allow some distance between themselves and their child—at least between their expectations and their child’s actual interests. Negative pressure, scolding, and hypercriticism won’t make kids improve. Encouraging your child to reach her goals and explore her natural talents is a much better atmosphere for growth. What this does is create a false sense of entitlement in your child. He or she learns to manipulate you into giving them what they want. Because it feels easy to get material goods, the child does not learn the reality of having to work for rewards or compensation. This can set them up not only for future problems in the adult work world, but also in setting and achieving their own personal goals. The solution: The parent with bottomless pockets needs to learn to say no—and to tolerate their child’s reactions when they don’t get what they want. If you want to use material things as rewards for your child, be sure they are connected with tangible expectations, effort, and accomplishments, not simply just because they asked. The parent stuck in this ineffective role acts like their child’s best friend: they go overboard trying to understand their child’s needs and motivation, often identifying quite deeply with their child. For example, if you didn’t enjoy school as a child, you may trivialize or minimalize your child’s poor school behavior. After all, you understand what he’s going through. The ticket puncher parent sides with the child in most circumstances, joining them in badmouthing authority figures, or ignoring rules they find unimportant. The problem with this style of parenting is not that you understand your child, it’s that you let your understanding keep you from following the rules. The child does not need to manage her behavior if she can convince you that her reasons are valid, or that it is someone else’s fault. The parent may then blame others people’s negative influence on their child, rather than see their child as wholly responsible for their own actions. The solution: The ticket-punching parent needs to make a clear distinction between understanding their child and holding them accountable for their actions. Just because you can relate to your child’s frustration does not mean they don’t have to follow the rules. You can be compassionate while also being clear about your expectations for their behavior. Parenting is tough, and looking at your own habits and behaviors can be uncomfortable, too. As you reflect on your own parenting style, think of it like this: it’s never a question of whether your style is right or wrong, but whether it’s currently working to create the behavior you want to see in your child. The bottom line is that ineffective parenting roles do not promote change, and they fail to promote accountability in a child. As James Lehman tells us again and again, in order for your child to truly grow and change, you’ll need to parent in ways that actually make that change happen. You can do it.